For some time now, the study of cognitive development has been far and away the most active discipline within developmental psychology. Although there would be much disagreement as to the exact proportion of papers published in develop- mental journals that could be considered cognitive, 50% seems like a conservative estimate. Hence, a series of scholarly books devoted to work in cognitive devel- opment is especially appropriate at this time. The Springer Series in Cognitive Development contains two basic types of books, namely, edited collections of original chapters by several authors, and original volumes written by one author or a small group of authors. 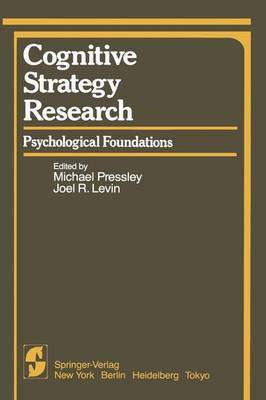 The flagship for the Springer Series is a serial publication of the "advances" type, carrying the subtitle Progress in Cognitive Development Research. Each volume in the Progress sequence is strongly thematic, in that it is limited to some well-defined domain of cognitive- developmental research (e.g., logical and mathematical development, development of learning). All Progress volumes will be edited collections. Editors of such collections, upon consultation with the Series Editor, may elect to have their books published either as contributions to the Progress sequence or as separate volumes. All books written by one author or a small group of authors are being published as separate volumes within the series.